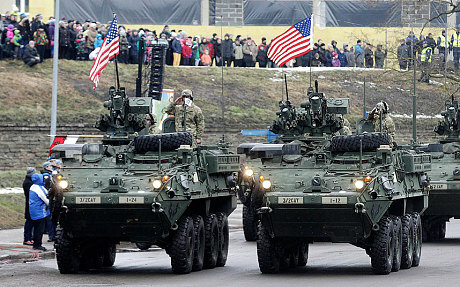 Armoured vehicles from the US Army’s Second Cavalry Regiment and British troops were officially taking part in a military parade marking Estonia’s Independence Day, but the choice of location was deeply symbolic. The city of Narva sits in the easternmost part of Estonia, where the country’s border juts out into Russia, and has been cited as a potential target for the Kremlin if it should turn its attention from Ukraine to the Baltic states. A majority of the city’s 60,000 residents are ethnically Russian.